This Mastiff Royal Collar is Handmade and Nappa Padded. 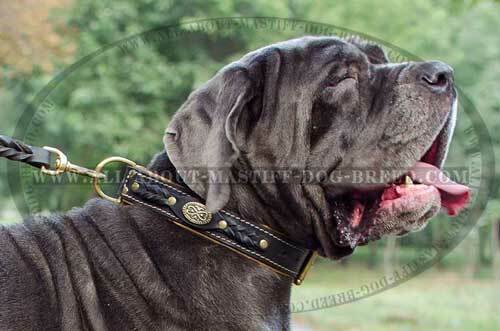 The Leather Collar is braided for stylish look of your dog. 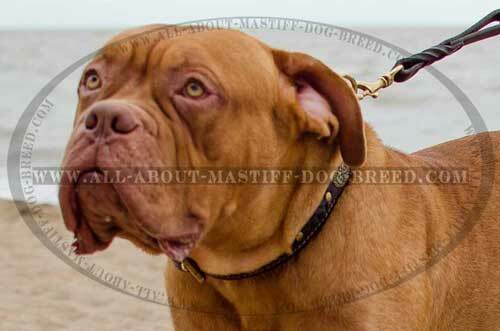 How to make your Mastiff look different among the pack of dogs on your street? If this problem disturbs you, then choose this braided leather dog collar for fashionable outfit of your pet. 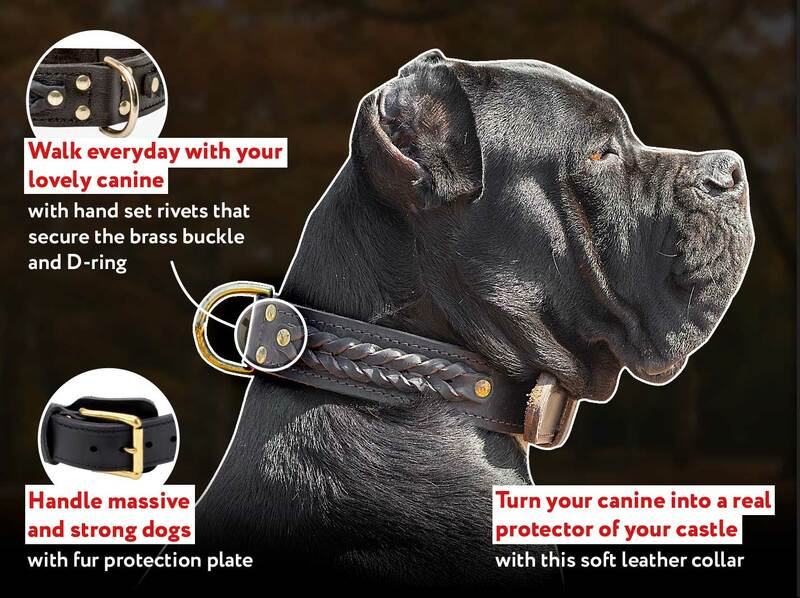 This excellent collar is Nappa Padded and it means your beloved canine won't experience any discomfort while wearing it. 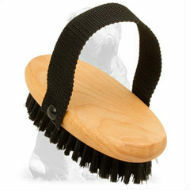 Royal braids add more chic and style to this superior item. This gear will do you a great service during walking your powerful Mastiff. 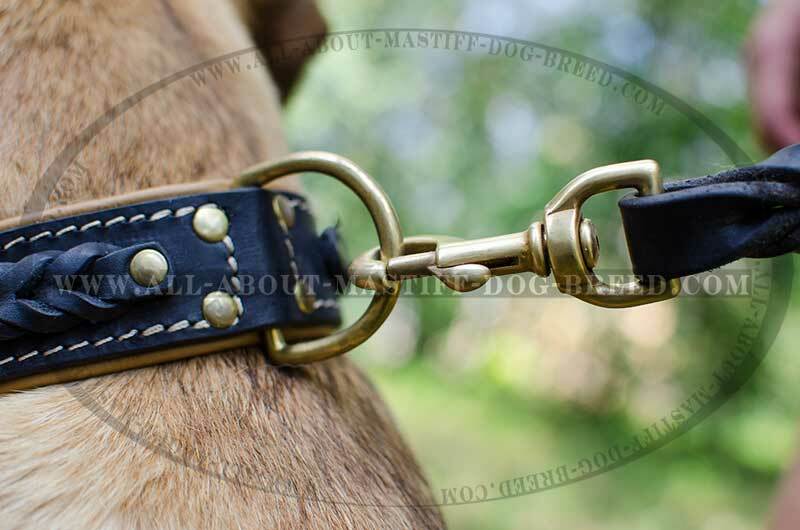 Being made of genuine leather with brass hardware, this durable collar won't let you down. 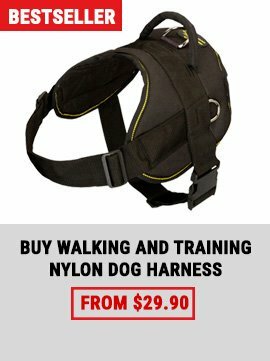 It's high time to try a really strong and fashion dog accessory! 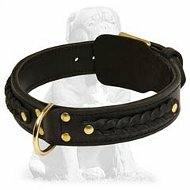 To achieve a superior comfort, the collar should be definitely made of high quality natural material. 100% full grain leather was chosen for manufacturing this gear. 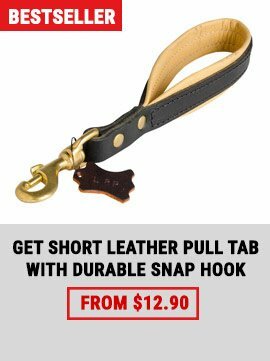 It makes the item extra strong and difficult to tear. 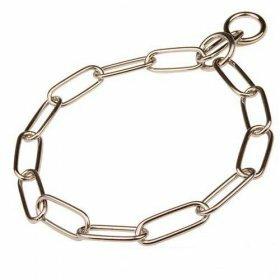 On the other hand, it's very soft and doesn't irritate or rub your pet's skin. 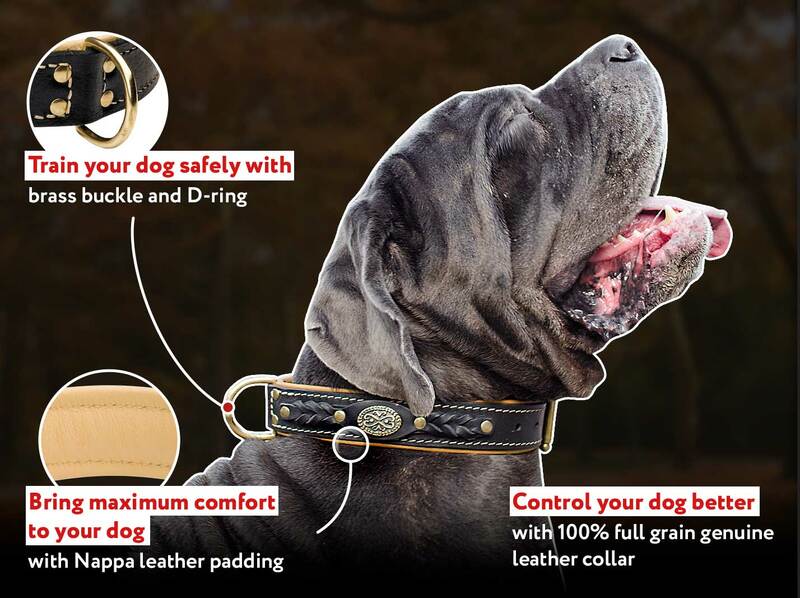 Genuine leather is eco-friendly and hypoallergenic stuff, so you shouldn't worry about the dog's health. 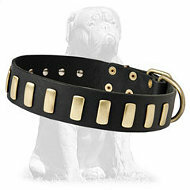 For the best reliability of this collar, all parts are carefully stitched and fixed with rivets. 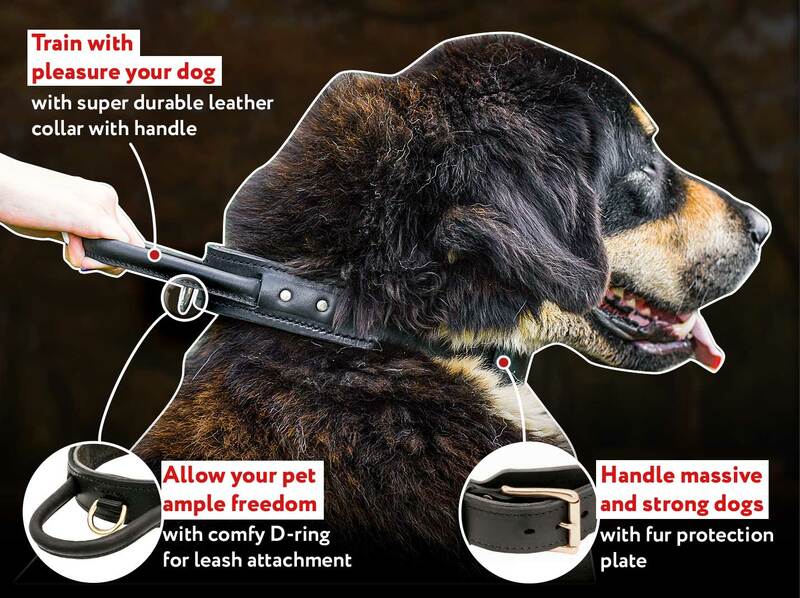 Special soft padding inside prevents pet's fur from rubbing. 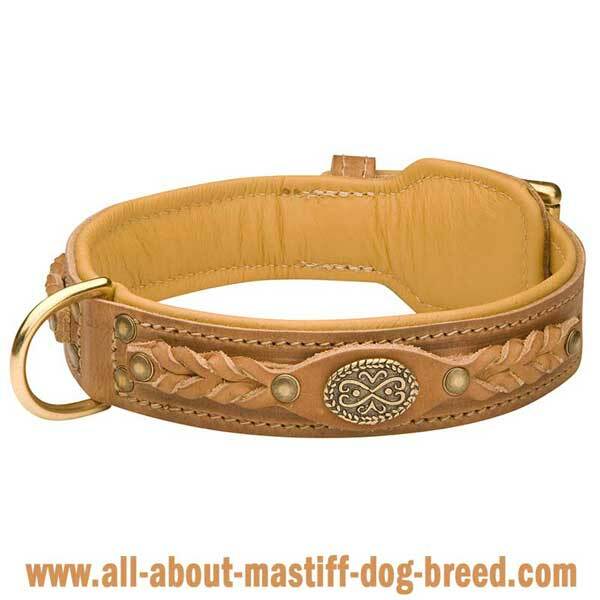 Super adjustable leather allows this gear to sit snugly. 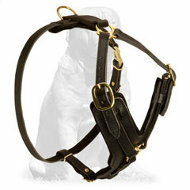 Stunning leather braids adorn the collar and reinforce it. Brass helps to prevent rust and corrosion. So, all the fittings stay like new for a long time. 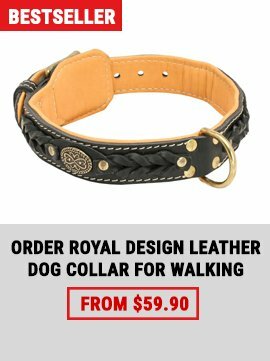 Top quality Collar, best i have seen. very happy with the quality and the material used to make this collar, high end leather and very large good quality rivets. will buy another when my english out grows this one.....only issue was when purchaes i had to email them a week later to ask why i had not recieved any shipping conformation, only to find out item was commng from Isreal. assumed it was froom the US as the site show US address. 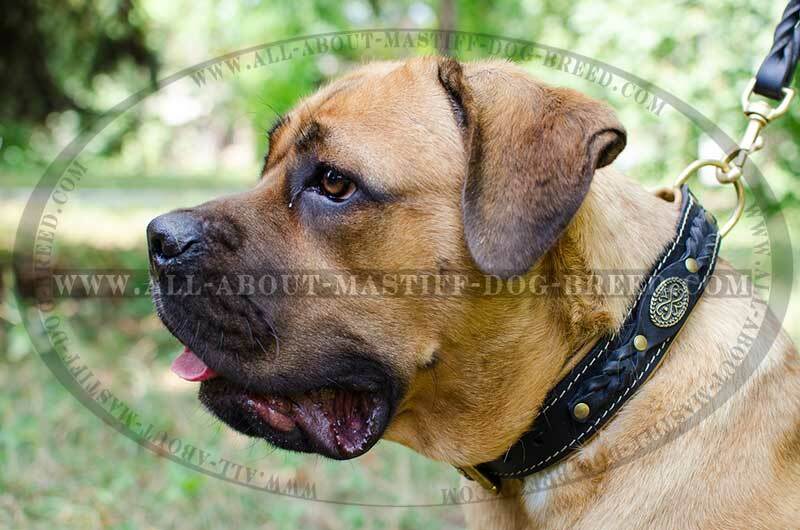 We got this collar and a new tag for our English Mastiff - Harlequin for Christmas! Love the collar, Love the fit! Well worth the money.